Pumpkin spice enthusiasts have been able to sip on their autumnal drinks of choice at Starbucks and Dunkin' since August, but there's still another major comforting flavor to look forward to this season: peppermint! 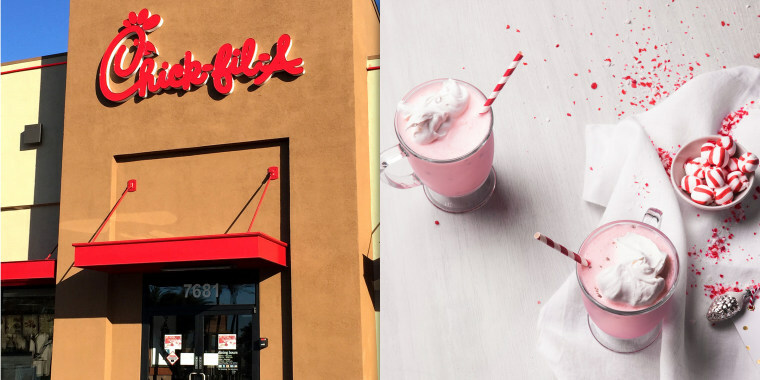 On Monday, Chick-fil-A announced the return of its wildly popular Peppermint Chocolate Chip Milkshake — and people are already sharing their excitement about the sweet treat all over social media. The ice cream-based drink is flavored with peppermint syrup and something called "chocolate peppermint twist." Once blended, it has little bits of chocolate throughout. A fluffy crown of whipped cream is the finishing touch. The holiday sipper has 680 calories — the most of all of the chain's shakes — but that's not stopping people on Twitter from vowing to get their hands on the drink as soon as possible. Many people shared the same meme of actress Melissa McCarthy dancing with excitement and singing along to Kelis's hit song "Milkshake." One person is thinking about making a long drive to get his hands on one. About ready to drive 6 hours to Kalispell right now. Another person seems willing to run (not walk) to a Chick-fil-A to pick up the holiday drink. Even though Mondays can be a drag, the news about the shake's return made at least one person's day way better. Best news on a Monday!!!!!!! One lucky person said that he was able to have the holiday shake on Saturday — two whole days before the official announcement. Although many people on Twitter are welcoming the drink back with open arms, peppermint isn't for everyone. One person used the news to tell the chain which menu item should really make a comeback. No thanks. Bring back the spicy chicken biscuit. Before re-releasing the shake, Chick-fil-A crunched some numbers and figured out the top 10 cities in the U.S. that had placed the most orders of the drink in 2017. Apparently, people in Erie, Pennsylvania, consumed the most Peppermint Chocolate Chip Milkshakes last year, according to a company statement released Monday. The folks in Lansing, Michigan, were the second most obsessed with the shake. The chain is offering the minty concoction nationwide through Jan. 5, so there's still plenty of time to enjoy pumpkin spice season and get in the mood for the chocolate and candy cane-inspired drink.